I’m typing sandwiched between an oriental rug hanging on the wall and two Soviet-era televisions facing each other across the room which, as those of you who’ve Skyped with me surely know, means I’m back in my apartment. The bus from camp made it to good ole Yampil Sunday night so I’ve had the last few days to get my apartment in order, send emails & put a kibash on the rumor mill that was all abuzz with news that I’d decided to hop a plane to America permanently without any of my things (apparently a 2 month absense is too much). I’m basically trying to think of things to stay busy with to fill the 2 weeks of free-time before school starts thus avoiding a boredom induced freak out. The solitude is even more pronounced as my cell phone sadly did not make it to Yampil with me & is likely floating somewhere in the black hole that is the rickety bus from Nemiriv. Despite never leaving the bus in all 3 and a half hours, it disappeared from my bag sometime in the last 3o minutes of the ride & the surly driver yelled at me in Russian when I tried to look for it so I’m afraid the grimy floor might be its new home. There’s hope for keeping my same number if I can hold off buying a new one until I make the trek to a big city though, so I’m trying a few days of being a bit unreachable. Yet another reason I heart the internet. It’s only been two days but my schedule has steadied out to include a nice balance of housework & random pursuits . I spend a solid two hours doing laundry by hand each morning & will for the next 3 days as I have substantially more dirty clothes than I do space in the bucket or on the clothesline in my front yard. It should be an irritation, but given the empty space on my calendar & the fact that it smells wonderful after hanging outside in the summer sun it’s really quite nice. Another thing that I probably shouldn’t enjoy quite as much as I do is vacuuming. Once prone to sleepless nights & constant vulnerability thanks to stupid spiders I now patrol the premises twice a day completely empowered with my trusty suction hose in tow. 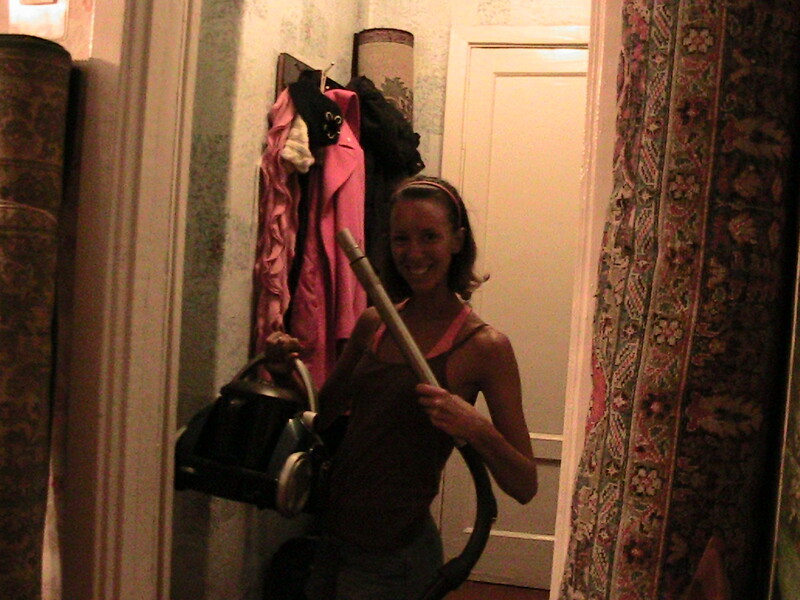 We (shockingly) do things a little different here & thus opt for vacuums that are little, low to the ground & decidedly not pushable so I hoist it on my hip & attack cobwebs in every ceiling corner feeling straight up Ghostbusteresque. Sorry, it probably doesn’t justify this much of your valuable time, but the possibly sad truth is that it’s certainly become a bright spot of my day & a nice change to feel more at home in my apartment. So I guess that accounts for the crazy part of my days. As for the lazy & hazy… I have been able to catch up on some glorious pop culture from the past 10 months via gossip magazines courtesy of thoughtful care package senders & now devote too much time to being mad at Jesse James. I’ve also taken to running at the stadium in town since Mom ix-nayed my solo strolls by the river. I think I found a benefit of the constant attention given the weirdo American as today I had a few 8 year old girls in dresses running with me (even though girls aren’t supposed to sweat here) & watched in surprise as they joined in when I started picking up trash on the cool down lap. That’s why we love camps so much. 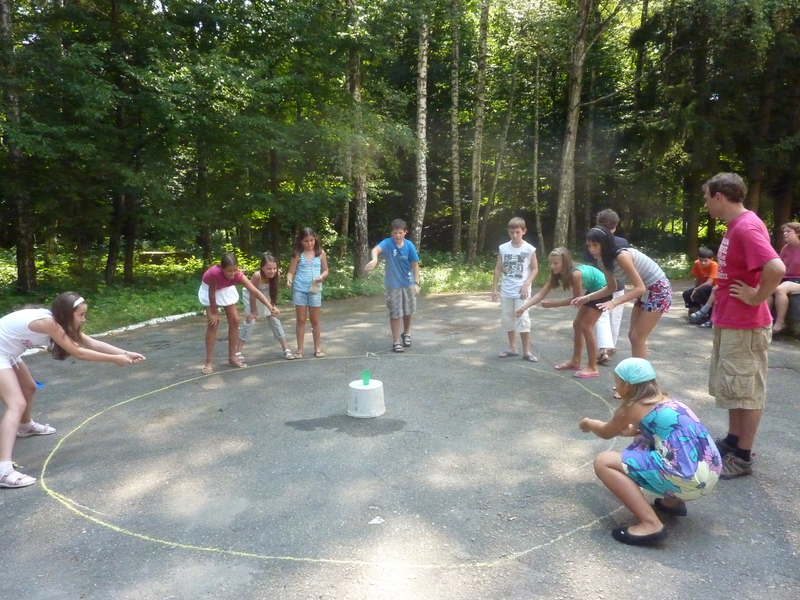 The one I was at these past two weeks was an English immersion camp for students from all over Ukraine. The kids were mostly from Kyiv, Odessa, & other big cities & fairly well off (one girl’s dad is the President of Honda’s Ukraine division) but were cute & nice. They were assigned to Ukrainian counselors who were responsible for the brunt of taking care of them & making sure they attended their classes throughout the day. 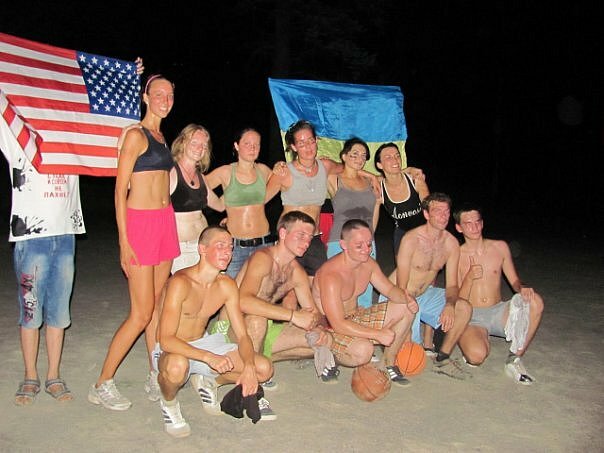 All of the sessions were in English & each day had a different theme but the Ukrainian teachers were supposed to focus on dialogue & grammar while the Americans’ lessons were a free for all of games, leadership training & culture lessons. We taught 5 sessions a day but the topics included ‘Build Me Up Buttercup’ sing alongs, watermelon seed spitting contests, Capture the Flag, & gender equality so it didn’t feel much like work. 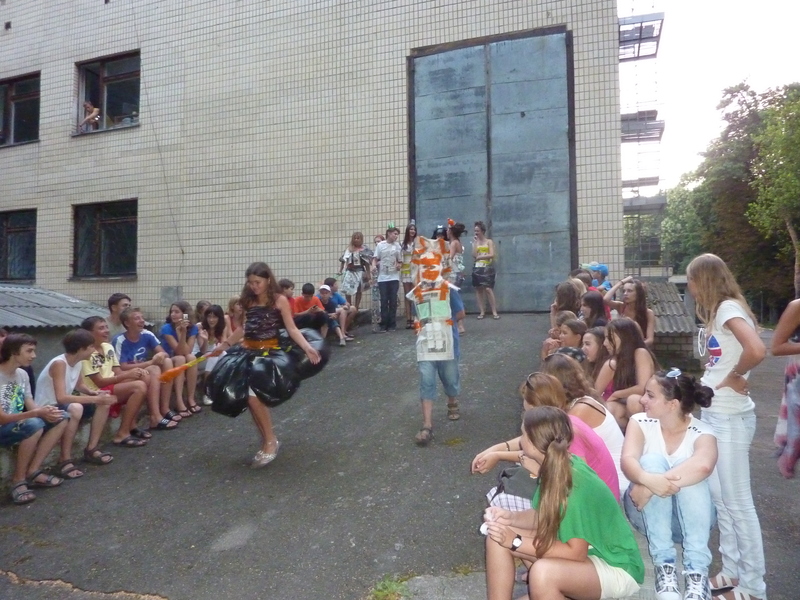 And a few more of my favorite activities, the trash fashion show inspired by Project Runway & an ‘International’ disco where the college-educated Americans went as Egyptians wearing… toga sheets? We try. That’s all the ‘news’ here. We’ve got big plans for a volunteer reunion before school starts up again September 1 & I promised my teacher friend Olha & her husband that I’d introduce them to a fiesta complete with Ukrainianized salsa & chips & the irreplaceable Patron Mom brought over. Maybe even another facebook album. Big things.